"Beneficial to anyone who is looking to increase and improve a variety of aspects in their lives, from productivity, healthy eating, and managing emotions. This book is so full of things to try that you’ll want to jump right in while you read. This is the perfect book for anyone looking to make some changes to their life or just find new things to try throughout their day." "While your brain is a complicated organ, taking care of it doesn’t have to be. 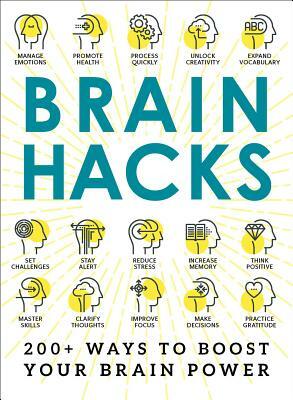 The editors of Brain Hacks have made it easier than ever to keep your mind nimble by compiling over 200 research-backed ways you can care for your brain, just by tweaking the things you already do. Whether you have a few precious minutes to spare at your desk or an evening to commit to some (literal) mindful self-care, trying any of these hacks is a step towards better brain health."